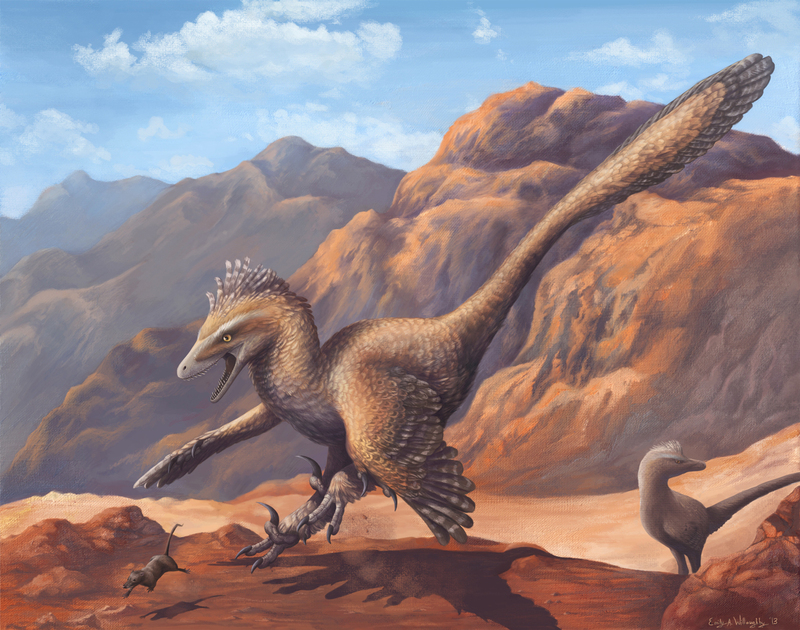 This is the famous Velociraptor mongoliensis in its native late Cretaceous Gobi Desert. Velociraptor was a small dromaeosaur, or raptor dinosaur, and contrary to its most famous depictions was almost certainly feathered from head to tail. This is no longer based merely on phylogenic evidence, either - as of 2007, reanalysis of the fossil has shown that its posterior forearm contains quite obvious quill knobs. Velociraptor surely went after larger prey like Protoceratops at least occasionally, as we have fossil evidence that it certainly did so. 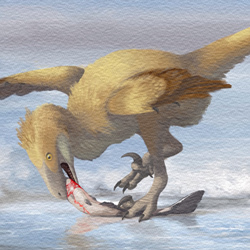 However, like many modern mid-sized carnivores, its diet probably consisted of a large proportion of much smaller animals, which it may have ambushed or sniffed out of crevices. I imagine such a predation event would have been rather felid in nature, wherein the animal displayed a curious mixture of predatory grace and pure silly ridiculousness as it bounced and flailed after a frantic prey animal. 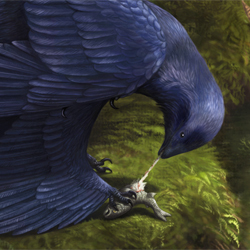 In this case the prey in question is Zalambdalestes, a small shrewlike eutherian from the Djadochta Formation of Inner Mongolia.